Here is a question asking how to build with bamboo, using it to build tropical homes. This is from a friend of mine, David S. who along with his wife Lin has left the rat race to live on the tropical northern coast of Peru. Hi Bill. It was nice to see your page on tropical building. Do you ever build with bamboo or know any good resources? We live a few degrees from the equator in Peru. Where we live, though, it is very dry and desert like right on the beach. For about 5 months of the year it is very hot a humid but little rainfall. It is sunny pretty much every day of the year, perfect for the beach. Since I was a surfer all my life, we love it. Since it is not rainy here, bamboo lasts longer than in other areas. We have always loved the look and feel of bamboo and have lived in houses made of split bamboo and "chonta" a very hard palm wood for columns. This was in the jungles of Peru and Ecuador where the wood, bamboo, etc, didn't last too long, but the simple construction made it very easy to build again and materials close at hand. We would like to build with bamboo here and need some good resources on joining, structural support, etc. Quite frankly David you probably know as much about it as I do. I know the basic facts about it and have seen it growing in huge clumps along our river banks here in the Top End, but as far as building goes I have not used it. I have used manufactured laminated bamboo for stair treads that were very strong and stiff for their thickness, and I've used similar laminated bamboo flooring. So what follows is more of a photo essay that may just give you some ideas. As far as resources go I can only point you to Google. When I think of bamboo and building I immediately think of scaffolding. In the old days in Singapore I have seen many high rise building under construction that were scaffolded with bamboo poles. It was an incredible sight, and yet if we think about it, every building ever built prior to the last 70 years or so would have been scaffolding with lashed together timber poles et. Not any more, I was lucky to see this small renovation job still using it. The guy that I saw was lashing the poles together in the traditional way with thin strips of bamboo about 3 ft long. He had a large bundle of them tucked into his belt. 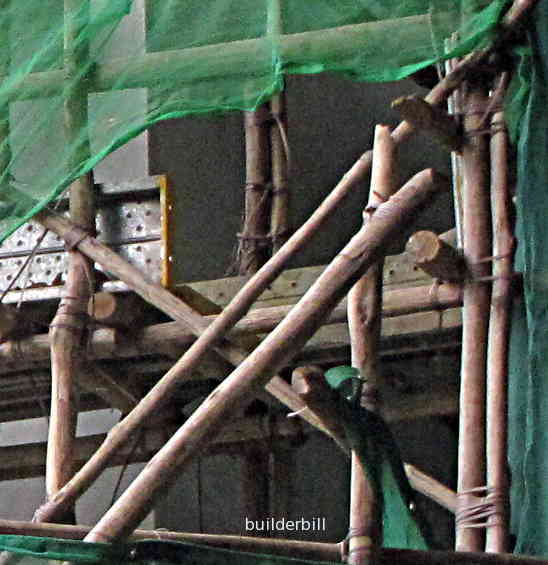 I have photos somewhere of a scaffolding in Thailand that used fresh green bamboo, so I guess that they can use it straight away at a pinch, but it does seem that it is cut green and then usually stored in stacks vertically in frames with the widest ends at the bottom to allow the sap to dry out. 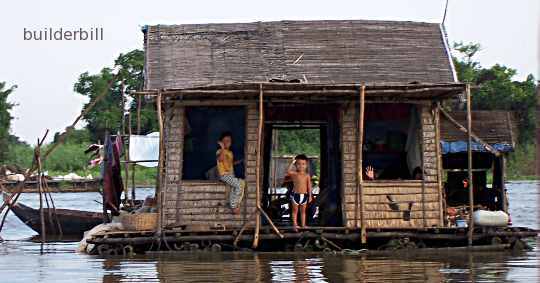 There are still a lot of these river dwellings in this part of S.E. Asia. The raft part consists of layers of bamboo lashed together at right angles to each other. I'm not sure if they use the material as is or if they seal it in some way. The walls and roof structure would also be framed with bamboo and the cladding is woven palm leaves. 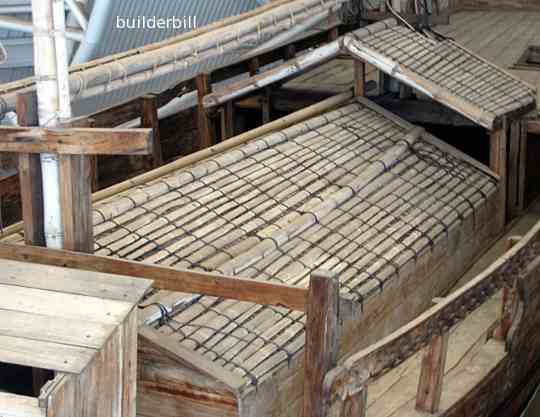 Quite a few of the raft houses have huge frames entirely out of bamboo from which they suspend their fishing nets. All over S.E. Asia bamboo is used for varying patterns of fish nets. It's long lengths and great strength to weight ratio makes it unbeatable for this work. Many of the poles get to 30ft or so and they are lashed to others to increase the stiffness. Fish farms - Mekong Delta, Vietnam. 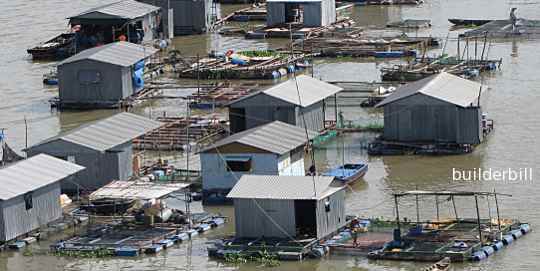 There are many thousands of these fish farming communities in the Mekong Delta. I guess that in the old days bamboo would have played a lot greater part in the construction, but today the floatation is derived from plastic 44 gallon barrels. Bamboo is relegated to the poles for supporting awnings etc. 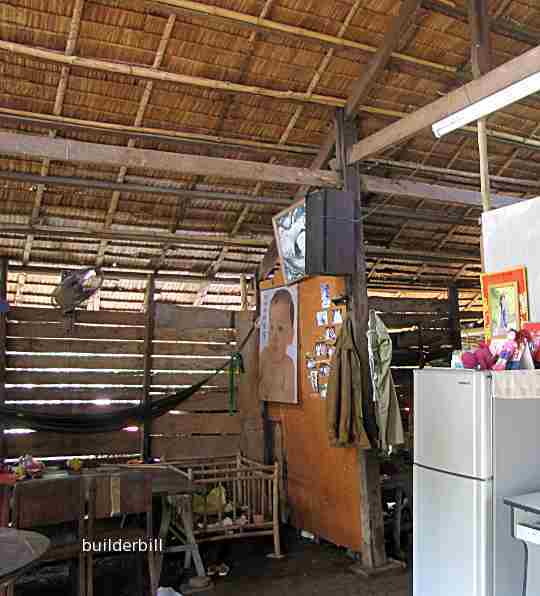 The house above has electricity laid on so it is complete with fridge and TV but the roof and wall framing is of bamboo and palm thatch. The main truss and column supports are out of solid timber, at about 12ft centres. 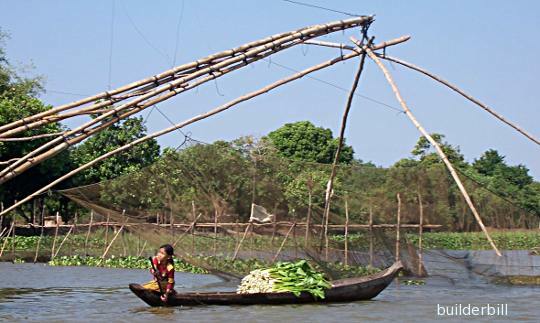 An incredibly ingenious way of fishing using almost entirely bamboo poles. The platform contain a windlass that is used to raise and lower the net. When the net is raised the fisherman paddles over to the net in his boat and ladles the fish out of the net and into the boat. Built with bamboo - Que Non again. 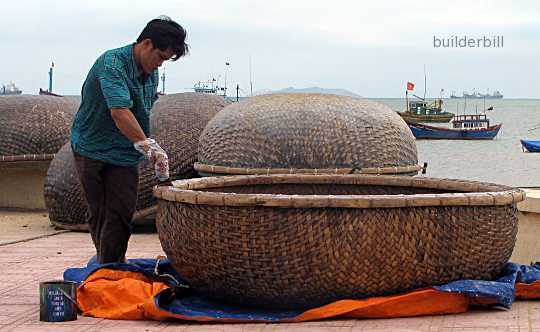 These small basket like fishing boats remind me of the coracles that were common in Europe many centuries ago. It would not be too much of a stretch to say that they are also made out of bamboo, in one of it's smaller varieties. Many of these craft further up the coast have been sealed with a black bituminous style of paint, but in Que Non this guy is giving his boat a coat of a really viscous oily type of fairly clear type of varnish/sealer. Probably the traditional method. Build with bamboo - A small section of a huge covered flower nursery near Dalat, Vietnam. 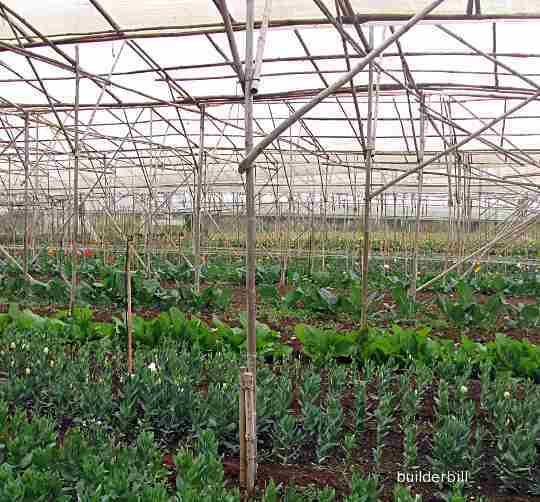 This is one of many of these huge clear plastic covered greenhouses in the central highlands of Vietnam. Once again bamboo being used for what it is best for, lightweight and cost effective semi-permanent structures. 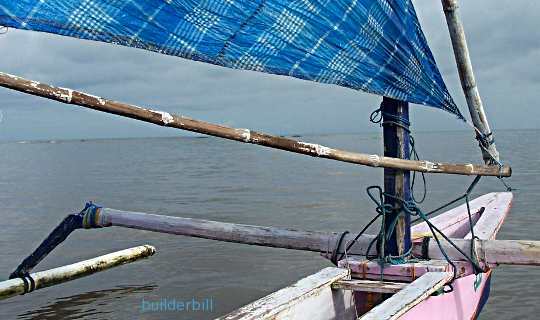 I have seen a small outrigger canoe float similar to the above one, where the support arm was morticed into the bamboo float, but at the same time it was also lashed with twine. Every other structural joint that I have seen fixing lengths of bamboo together has been by lashing. In Indonesia they seem to now favour very cheap poly rope or twine for this. Cover to the hold of a traditional Sailing, Indonesian fishing boat. This tied together bamboo hatch cover can be rolled up out of the way, similar to a rattan blind. 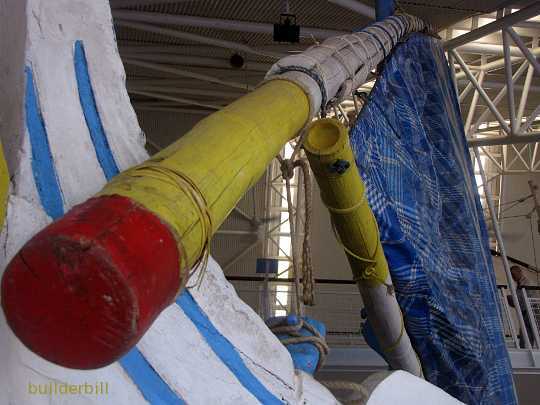 A close up of Indonesian sail spars. Note the split bamboo lashed either side of the main piece to add extra strength. Normally when extra strength is needed like in masts they just use two or three poles lashed together and some of the larger sailing boats then have a bipod or tripod arrangement that allows them to carry large sails. The actual spars on these lateen sails however have to be light, strong and have some flexibility to handle gusts. Solid timber would be far to heavy for this use, and it is only recently that aluminium and carbon fibre composites have come anywhere near the capacity of plain bamboo to do this job. My take on it is that it is a marvellous material when used as it was used in these examples here, but for other jobs then it may be just too labour intensive compared to other materials. In most of the places I have seen it used, as the people get more affluent then bamboo seems to take second place.